A May 2, 2012 photo of Rick Gion in one of his natural habitats. 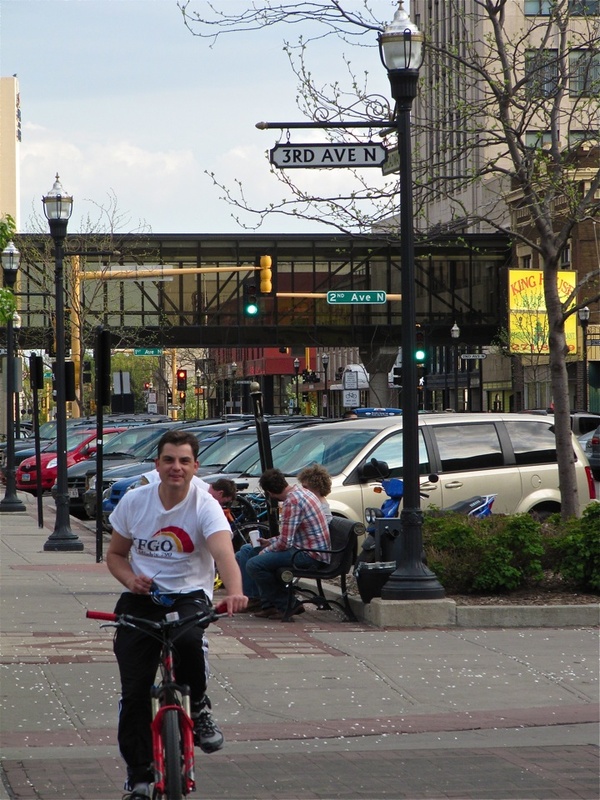 About Main and Broadway in Fargo on May 2, 2012. 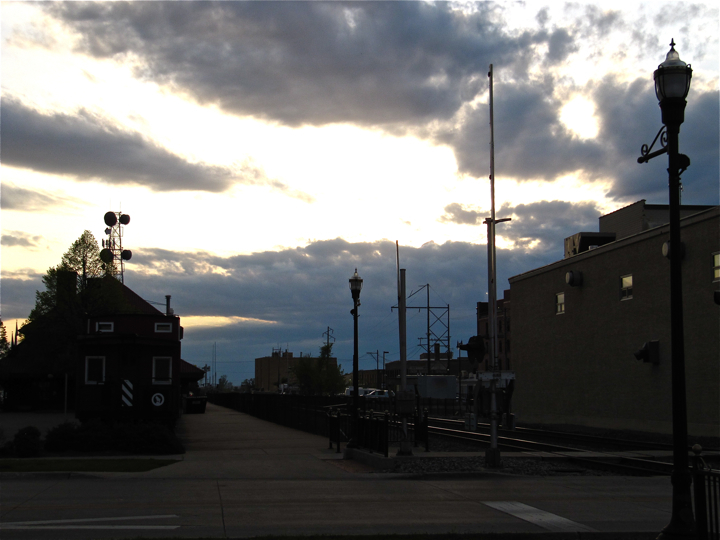 Photo looks west toward the storm dumping rain on central North Dakota. 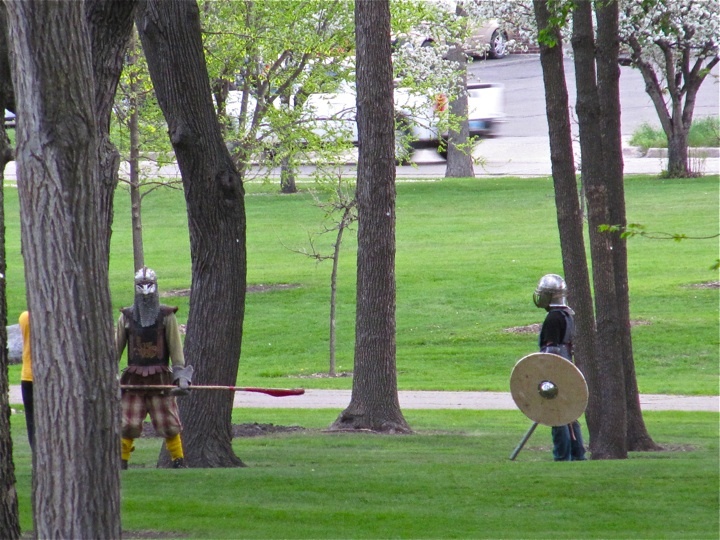 Knights at Island Park in downtown Fargo, North Dakota. phone conversation had ended and another couple folks spotted me. So more light banter ensued, and I remember asking the two if they had yet seen the Cold War Comedy, “Spies Like Us.” This was the third time in 24 hours that I’ve asked groups of two or more if they had viewed this movie. Each time the groups have responded with no. For some reason I think it’s important for people to watch it. After that, the final stretch of my walk took me back up Broadway, and I inadvertently ran into Den Bolda, perhaps one of the most accomplished Civil War reenactors in the tri-state area. I say this only after learning that Mr. Bolda had just finished attending another knitting class, this so he could reproduce vintage (aka, knit) Civil War wool socks to wear at all the 150th anniversary mock-battles back east. Nice work, Den. Nice work indeed. This entry was posted on Thursday, May 3rd, 2012 at 12:04 am	and tagged with Fargo, North Dakota and posted in Uncategorized. You can follow any responses to this entry through the RSS 2.0 feed. Remember to be careful near the HoDo. Some unsavory activity has been spotted there.